While most of us at the Duke Global Health Institute are spending our summer days on campus in Durham, more than 130 global health undergraduate and master’s students are applying their classroom learning to the real world in low-resource settings across the globe. “Fieldwork”—where a day’s work runs the gamut from conducting door-to-door surveys in a rural village to working with physicians in an urban hospital to teaching schoolchildren about health-related topics—is often a highlight of the global health program for students. It’s a time for discovering their global health passions, learning from community partners and reflecting on their experiences. 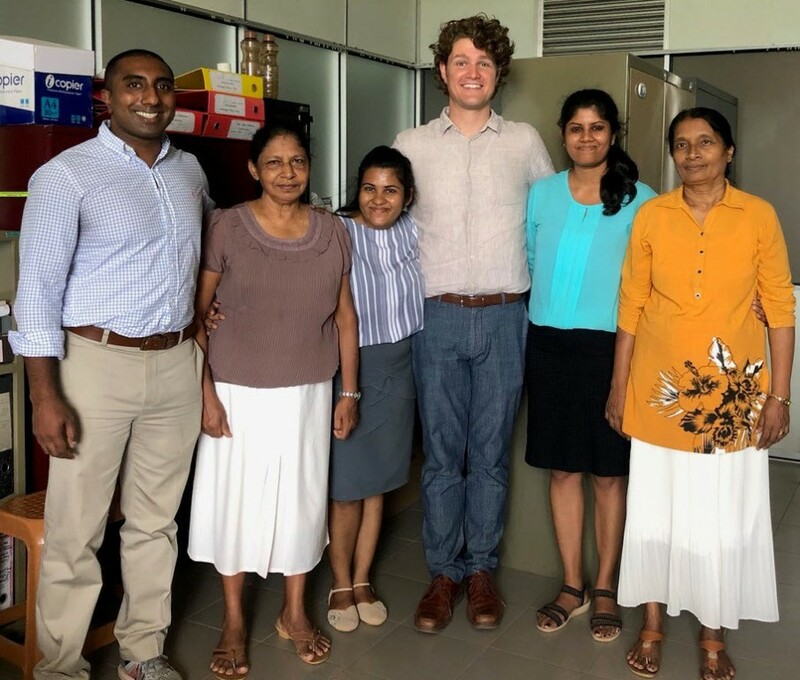 The purpose of Jacob's work in Sri Lanka was to identify the etiology and severity of lower respiratory tract infection to improve resource allocation and antibiotic stewardship at Karapitiya Teaching Hospital. What’s the biggest challenge you’ve overcome during your fieldwork? My greatest challenge during my fieldwork has been learning to adapt to new cultural environments. Although I was excited to leave for fieldwork, I was quite nervous. I was going to be in a new place, without all the simple luxuries I was used to and I wasn’t surrounded by any familiar faces. However, while it seemed difficult to navigate in the beginning, I am thankful for this experience because it forced me out of my comfort zone and instilled a desire to embrace the culture I am in. Most importantly, as a future global health researcher, it has given me confidence in my ability to thrive in other communities that are different from what I am used to. I am looking forward to my next adventure! What’s the most interesting thing you’ve learned during your fieldwork so far? I have learned the importance of improvising. In a field such as global health, there is always a chance that things will not go as planned. Depending on the circumstance, you can either be “proactive” or “reactive”. However, in research, since it is unpredictable at times, a balance is ideal. Within the first two weeks of my fieldwork, I saw this firsthand as I witnessed a viral outbreak overburden a local hospital in Galle, Sri Lanka. In the face of such a crippling outbreak, it amazed me to see how quickly our research team improvised and collaborated to assist the hospital staff with identifying and diagnosing patients with the virus. They were swiftly “reactive” to the situation and “proactively” brought the resources necessary to assist again if there is a similar outbreak in the future. This prompt, collaborative approach to this outbreak allowed me to experience global health in action and reminded me of why I am here. Dr. Sky Vanderburg, Dr. PPRMSDKR Panditharathna, Mrs. G.W.Swarnawathi. Loren is working with Catherine Staton, assistant professor of emergency medicine and global health, on a feasibility trial for an adaptive randomized clinical trial. The trial is testing whether sending SMS text messages with personalized messages can help reduce alcohol use in heavy drinkers. What’s the most useful thing you packed for your trip this summer? The most useful thing I packed with me this summer has been a second phone! Many locals have two or three cell phones to be able to use different SIM cards for better cell service in different areas. Having one phone with a Tanzanian SIM card allows me to make local phone calls and buy data for internet access so I can use my phone as a hotspot when I don't have WiFi available. What aspect of your fieldwork are you most excited about? I’m most excited about living in Moshi, Tanzania, and learning about how the locals live. 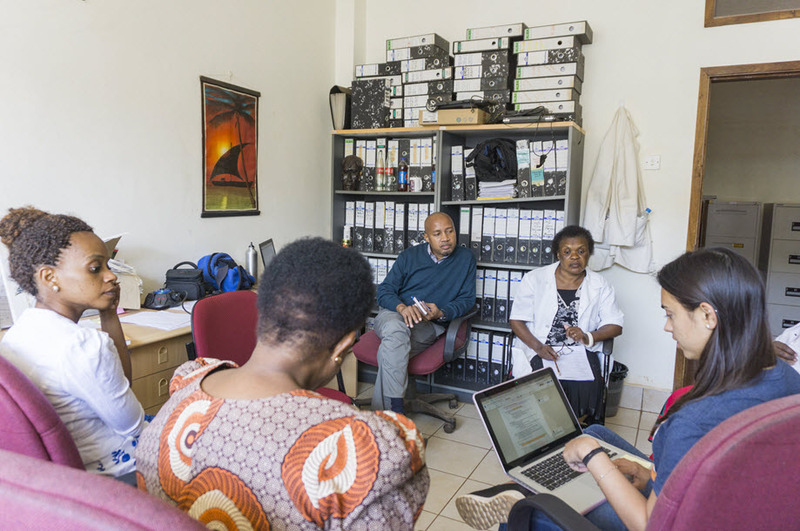 and other Tanzanian collaborators in the weekly casualty studies team meeting. Jessica is conducting a cross-sectional validation study to help the local medical team rapidly and accurately diagnose a detrimental neglected tropical disease, melioidosis, with a novel rapid diagnostic tool that employs lateral flow immunoassay, similar to a home pregnancy test. 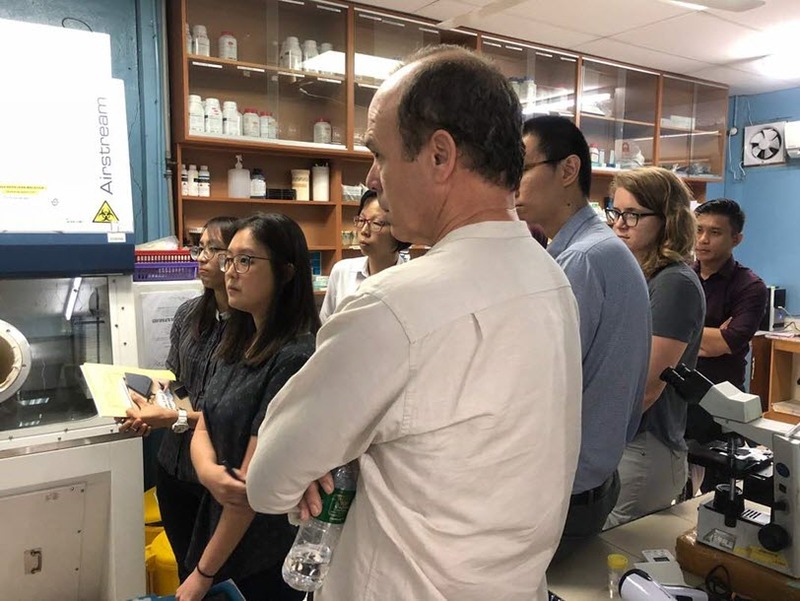 She’s working under the guidance of Gregory Gray, professor of medicine, global health and environmental health, and her on-site mentor, King Ching Hii. I was interested in this project because I’ve always wanted to combine my bench science research skills and human-based research. While melioidosis can lead to death within days of diagnosis, it’s a neglected disease that does not draw attention to the degree it should because it is prevalent only in Malaysia and northern Australia. The current diagnostics strategy in Kapit does not allow the medical team to provide treatment fast enough, so the idea of being able to introduce a novel rapid diagnostic tool is both exciting and rewarding. I am excited that on behalf of the Duke Global Health Institute, I’m serving as a bridge, both physically and metaphorically, between a resource-rich country and a limited resource country to supply a novel melioidosis diagnostic tool to a place where it is most needed. I’m also excited to help the team set up a molecular laboratory and train the local laboratorians and physicians how to perform molecular experiments so that their diagnostic capability can be strengthened and sustained past this summer. Jessica (second from left) discusses the molecular laboratory set up in Kapit Hospital. 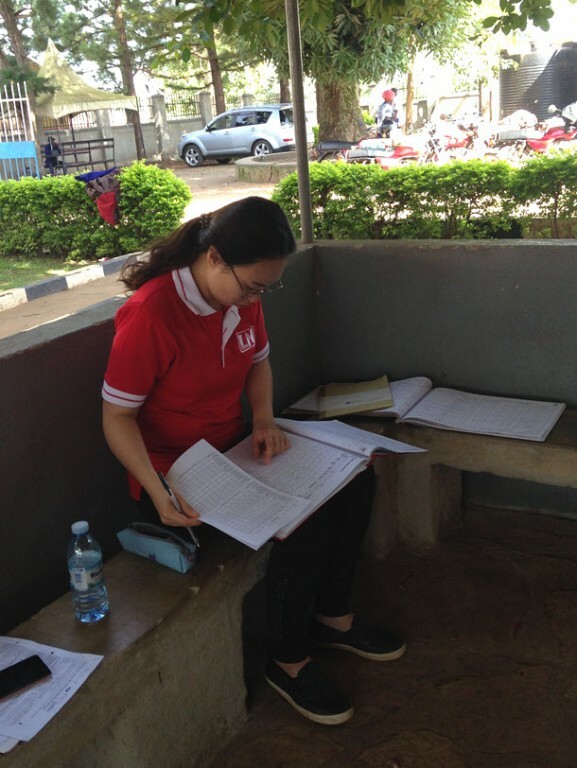 Under the mentorship of Joseph Egger, assistant professor of global health, MK is collecting baseline (pre-intervention) data from an ongoing project called Paper EMR (Electronic Medical Records). They’re collaborating with LifeNet International, an NGO in Uganda. This project is closely related to my thesis, which is improving medical documentation in rural health facilities in low- and middle-income countries. I knew this project will help me better understand my topic. Also, I have gained real-world experience of what's actually happening in medical documentation of these facilities. What has surprised you about your fieldwork? I was surprised by the poor quality and quantity of medical data at the facility level. Since paper is the primary form of medical documentation, it’s hard to conduct the quality check of these data. Even though the Ugandan Ministry of Health issues official registry books, information recorded in these books are hard to read and often incomplete. I am having difficulty interpreting the writing. Often, I find myself seeking help from the health providers. What’s the best piece of advice you got when preparing for your fieldwork? “Expect the unexpected!” I cannot stress this advice enough. For me, the data collection wasn’t the hardest and got easier with time. But staying in local hotels, eating local food, having no electricity and being alone are things that I didn't expect to be difficult. is an official book for each health facility to record all birth/delivery information at the facility. 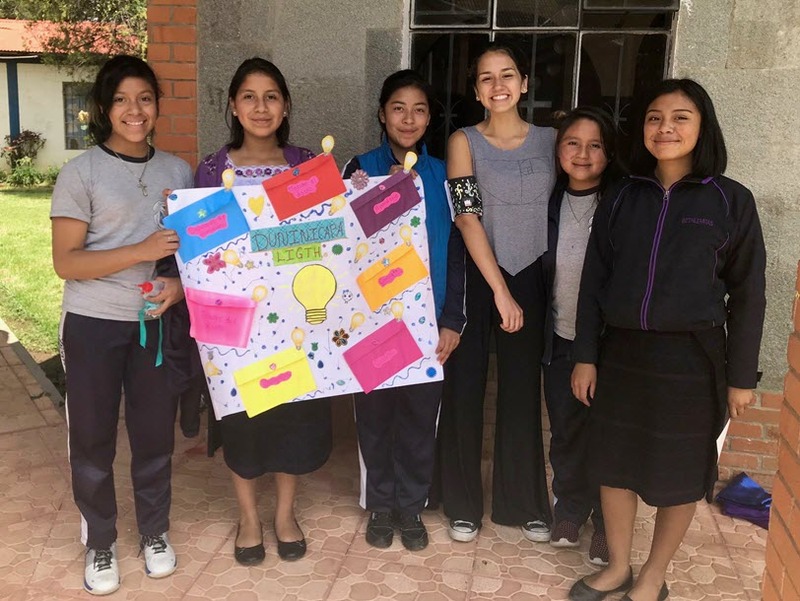 Under the supervision of biomedical engineering and global health professor Nimmi Ramanujam, Valentina taught a women’s STEM empowerment curriculum at an all-girls’ boarding school. What was the most important thing you’ve learned during your fieldwork? Days before traveling to Guatemala, I asked myself and panicked: How am I, a literature and global health major, supposed to teach an engineering curriculum to girls at this Institute? I took a class at Duke that taught me what I needed to know before going, but that didn't stop me from nervously second-guessing myself: What if they don’t like the class? What if things don’t go as planned? Once we arrived, we realized that things rarely went according to our plans; we changed the teaching schedule about five times to accommodate the girls’ classes, we adapted the curriculum according to their learning styles and we created some new lessons while we were already there. I’m the kind of person who loves schedules and plans, but there were more important things to worry about on this trip. I discovered that it was okay to cut class a little short if it meant spending more time bonding with the girls after school. I learned that going beyond teaching and being their friend was the most fulfilling aspect of our trip. The strong relationships that I established with the girls made the Institute feel like home after only a few weeks. built by one of her ninth grade project groups (pictured here). Want to read more student reflections? Check out our blog, Voices of DGHI! More than 130 undergraduate and graduate students are gaining hands-on global health experience across the globe this summer. I’m the kind of person who loves schedules and plans, but there were more important things to worry about on this trip.